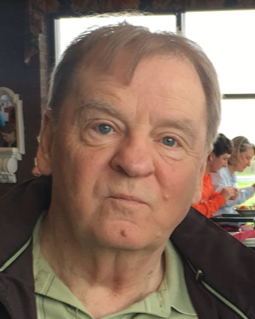 Terry James Kline Sr., 69, of Oil City died Sunday January 27, 2019 at UPMC Shady Side Hospital in Pittsburgh after Heart Surgery. He was the son of the late Donald and Dorothy Kimes Kline. He graduated from Oil City High School in 1967. He then married his wife of over 50 years Cathy Ambrose Kline of Franklin, PA. He attended Clarion University and retired from Polk Center as a Nurse. In his younger years he was a member of the Oil City Jaycees. He was a Methodist Lay Minister. Terry enjoyed Camping at Kibbe’s Island where he played on a softball team called “The Outhouses”. He loved writing and playing music and sang in his group “Mission”. He also enjoyed playing golf with his buddies Dan Black and Bob Griffin. He enjoyed riding the bike trails in the summer. He studied and practiced Martial Arts and ran a Karate School in Oil City in the 80’s where he earned a 2nd degree black belt and taught his sons and daughter. He also owned and operated “Kline Sweepers” in Oil City and Franklin, PA. He was devoted to his wife Cathy and their 3 children. Terry Kline Jr. and his wife Lisa of Rouseville, PA., Ted Kline of Oil City, and Amanda Kline Rohanna and husband Jim of Oil City. Also 4 grandchildren Tyler Kline and Allison Kline of Rouseville; and Caleb Rohanna and Price Rohanna of Oil City. Also surviving is a sister Donna Sutton, and many Nieces and nephews. Proceeding Terry in death is a sister Sandy Zimmerman. There will be no services per Terry requests. The Reinsel Funeral Home & Crematory is in charge of arrangements.